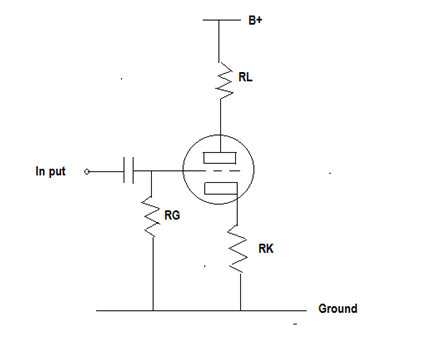 The only thing we have to determine is RL, RK, RG and B+ supply voltage. DIYers could easily suggest that RL= 30 Kohm, RK=1.2 Kohm, RG= 470Kohm and a B+ of about 350V, it works. In the other hand, RL= 22Kohm, RK= 1Kohm, RG= 1Mohm and B+ supply= 300V, experience tells us that it works fine too. The wide range of resistor value variation is easily accepted and this will encourage newcomers to design and build their fantastic machines. 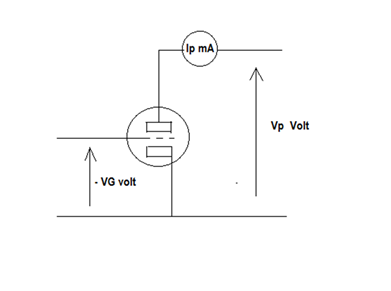 Let’s go inside to see what happened inside a triode: This a typical triode theory diagram, plate current Ip changes as plate voltage Vp varies for a fixed grid voltage –VG. Each curve shows the Ip and Vp plotting for a specified grid bias (-VG). If the –VG is large enough to cut off the tube conduction, the plate current= 0. 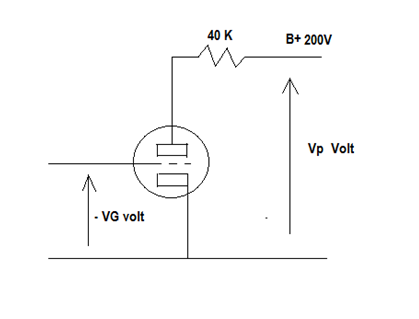 The voltage drop of 40K RL will be zero so that voltage applied at plate and cathode (VP)=200V. This is point one (200V, 0 mA). as if the plate and cathode short-circuited. The voltage drop at RL is 200V while the voltage at plate and cathode(VP)=0V. This is point two ( 0V, 5mA). The straight line connected point 1 and point 2 is known as LOAD LINE. Under 200V B+ supply and RL=40K, this tube can only work along within this 40K load line. This is because –VG caused no grid current(0mA), the current flow through 40K RL is equal to current flow through the plate to the cathode as they are connected in series. Also, the tube and the 40K resistor share part of the B+ supply. 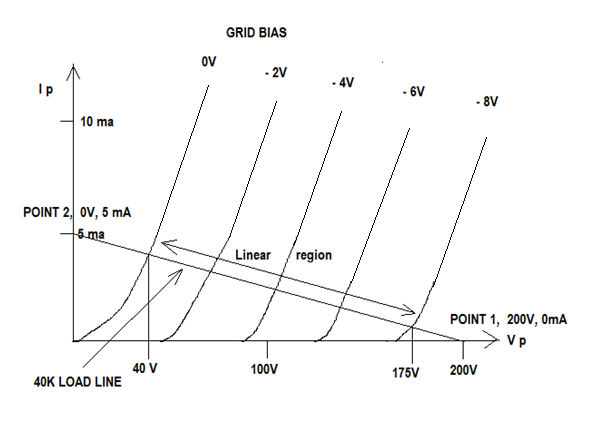 The range between 0V to -8V grid bias on the load line is called linear region. 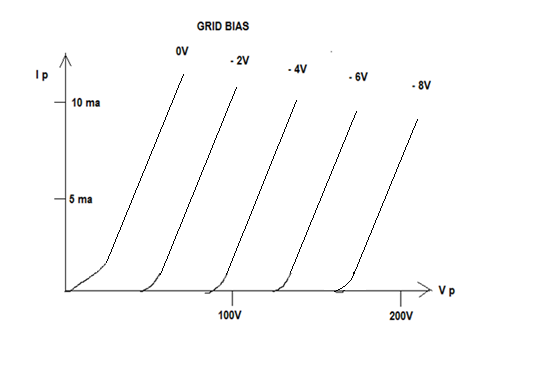 The variation of 0 to -8V grid bias caused 175-40= 135V variation on RL so that 135/8=16.8 times as the input signal. This 16.8 times is the gain of this voltage amplifier. 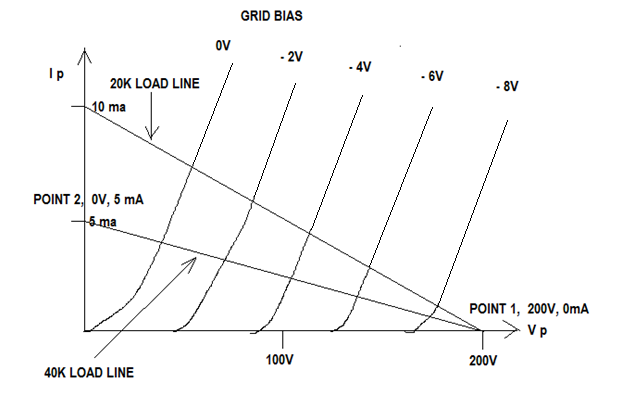 Working out of the linear region will cause serious distortion and this is prohibited in amplifier design. 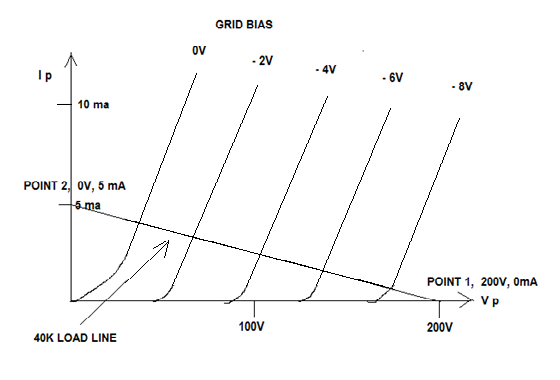 Think about operation point at VG=0V, input signal will swing both sides among 0V point at load line, obviously this will be out of the linear region and caused distortion. 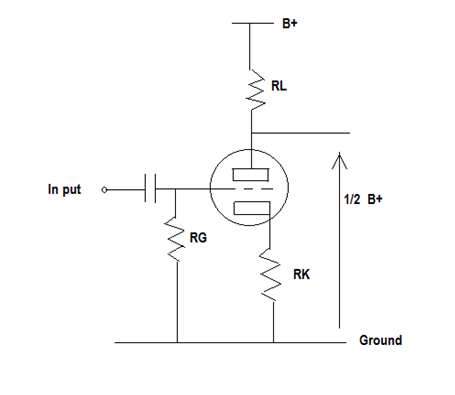 At -2V point, the input signal can swing between 0V to -4V so that the output is about 100-40=60V, gain=15. Further swing amplitude will go outside 0V point so that the maximum non-distorted output is 60V. At -4V point the input signal can swing between 0V to -8V so that the output is about 175-40=135V, gain=16.8 Further swing amplitude will go outside 0V and -8V point so that the maximum output is 135V. At -6V point the input signal can swing between -4V to -8V so that the output is about 175-100=75V, gain=18.7 Further swing amplitude will go outside -8V point so that the maximum output is 75V. City line supply voltage changes from time to time as well as the B+, constant DC supply regulator is not recommended as the sound quality reason, to maintain the static Vp at half B+ is important for maximum non-distorted output. We should carefully calculate RL and RK value so that for a 300V B+ Vp=300/2=150V and for a 400V B+ Vp=400/2=200V and so on. A half way voltage is always maintained irrespective with B+ supply changes. In technical terms, this is known as good power supply voltage regulation rejection.